The Hall of Columns is a dramatic, high-ceilinged corridor over 100 feet long. It runs along the North-South axis of the first floor of the House wing in the U.S. Capitol, directly beneath the Hall of the House of Representatives. The hall takes its name from the 28 fluted, white marble columns that line the corridor. The capitals in the Hall of Columns are a variation on the Corinthian order, incorporating not only classical acanthus leaves but also thistles and native American tobacco plants. Earlier uses of American vegetation in the building's capitals include Benjamin Henry Latrobe's corncob capitals in a first-floor vestibule and his tobacco-leaf capitals in the small Senate rotunda. The hall was constructed in the mid-19th century as part of architect Thomas U. Walter's extension of the Capitol, which added the present House and Senate wings and the dome. The marble for the columns was quarried at Lee, Massachusetts. Walter's annual report indicates that by October 1855 approximately half of the columns and pilasters had been set in place and the carving of the capitals was under way. By November 1856 all of the columns were in place, and the entablature and cast-iron ceiling were also complete. The ceiling was cast in Baltimore at the foundry of Hayward, Bartlett, and Co. The walls between the pilasters are finished in scagliola, an imitation marble made of finely ground gypsum and glue. Originally, the floor was laid with Minton tiles from England. These eventually became too badly worn for further use, and they were replaced in 1920–1924. The present floor is composed of square tiles of white marble from Alabama and black marble from New York. 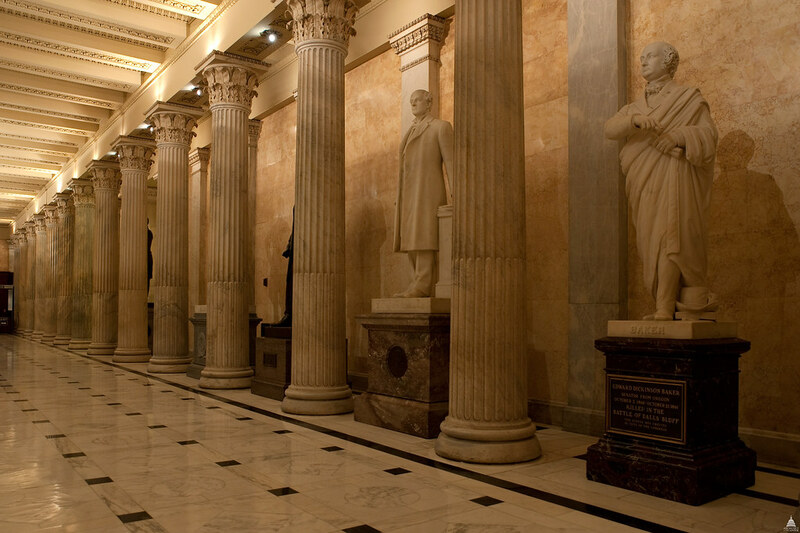 Since 1976, the hall has housed part of the National Statuary Hall Collection. These bronze and marble portrait sculptures have been donated to the U.S. Capitol by individual states in commemoration of notable citizens.